The Intel Corporation is a global leader in technological innovation and is known for producing computer processors used in the majority of PCs and other devices sold in the world. 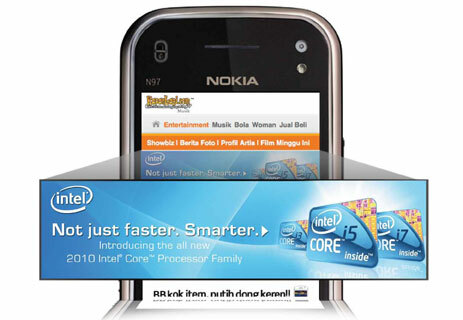 For the launch of their new Intel CoreTM processor family, they selected the InMobi network to run a mobile campaign. The campaign was designed to increase purchase intent and awareness of Intel products. Display ads were developed that helped convey the benefits of the new Intel CoreTM processor family. Users who clicked through the banners were sent to a WAP landing page. This page helped demonstrate the benefits to consumers. DoubleClick was integrated to allow Intel marketers to track the performance of the campaign with their existing DoubleClick account.